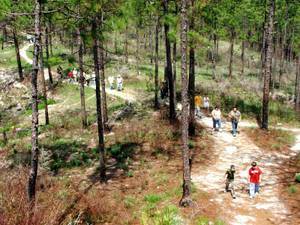 EASL is hosting a 4-wheeler trip in the Kisatchie District on Saturday, May 19. A ranger will lead riders through the Sandstone Trail, which is about 35 miles long. Expect the ride to take around 3 – 4 hours. A meal will be served at the end of the ride. The only restriction for 4-wheelers or other ATV’s is they cannot be wider than 50” due to the width of some bridges on the trail. Riders are not required to wear helmets and they can ride double. Members of other LWF affiliates are welcome to join. The group will be meeting rangers at Exit 119 on I-49 at 9am. Please respond to Francis Gautreaux so that he can keep a count of those planning to attend. For more information or to register, contact Francis Gautreaux with EASL and provide your name and phone number. You can reach him at 225.715.5749 (cell), 225.673.4991 (home) or email him at fgautreaux@cox.net. Many thanks to the rangers at Kisatchie National Forest for helping arrange this trip.